If you’re reading this, then the new Northern Spark website has successfully gone live! 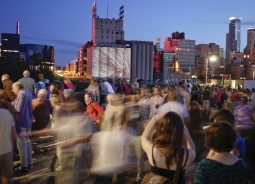 My Night is a feature that lets you create a customized list of the projects you want to see at Northern Spark. Add (or remove) projects using the “My Night” button — look for it on the Artists & Projects list as well as on individual project pages.Your “My Night” list can be printed, shared, or transferred to the festival’s mobile app. In addition to a traditional printed guide we are happy to announce that Northern Spark 2012 has a mobile app available (now!!!) for both iPhone and Android.